After six months of living at the edge of a national forest, I would have expected I’d be used to the feeling by now, getting dizzy as I watch the tree tops sway in the wind. Today I realized, I will never get used to it, and to be honest, I’m happy about that. There isn’t a day that goes by when I’m not in awe over my surroundings. Today we had a little fun with math – which is something I never thought I’d ever hear myself say! We determined the height of one of the trees we look at every day (with a little help). The answer? Seventy-five feet. The trees that surround me every day are 75-85 feet tall. 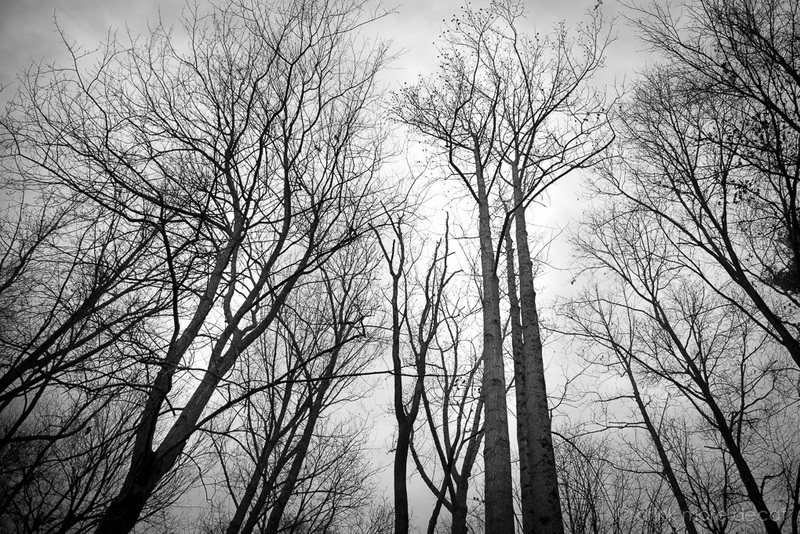 * Since it’s Spring it feels odd to post a photo taken this past Winter, but it shows our wondrous trees! This was an unexpected surprise this morning! 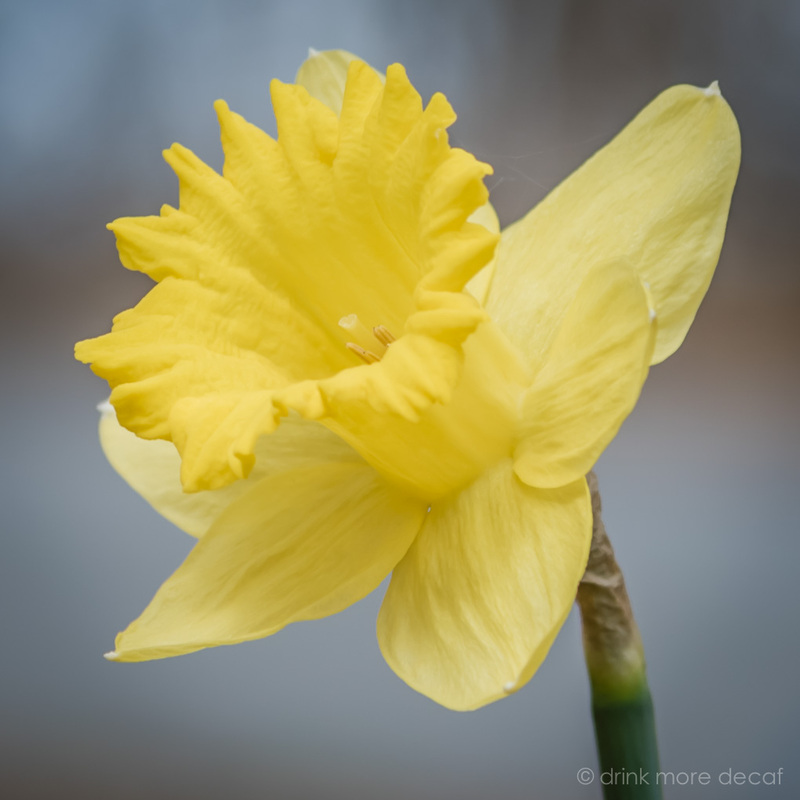 Spring had made an appearance in our yard! It baffles me how a flower can appear overnight where there was nothing but a green stalk the day before. Do I need to know what this flower is to keep it alive? Do zombie plants perennials need any special attention or do they just sort of take care of themselves? After 8 years of reading books on Kindle, I finally understand what makes someone want to throw their Kindle against the wall – or use it to slap the face of the author who destroyed a world they so carefully built. 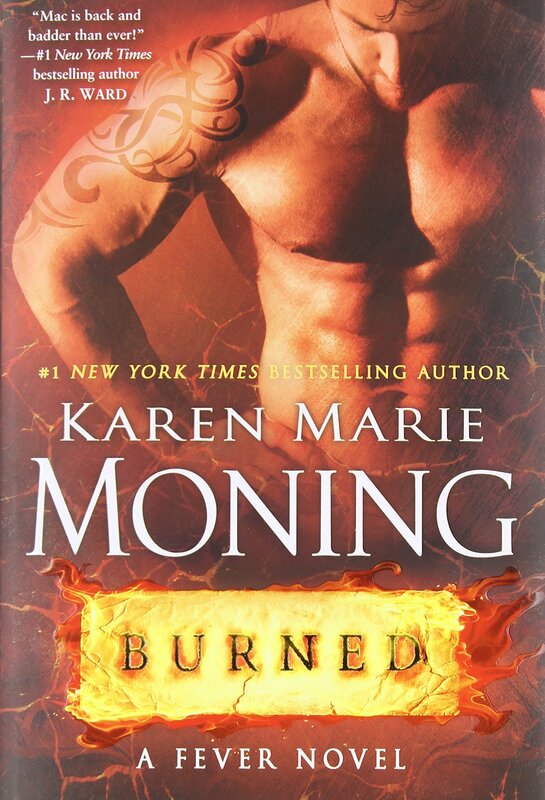 Burned by Karen Marie Moning, is the 7th book in the Fever series, and the last book by KMM I will read. Kick off the 7th book with a scene that occurred in Book 1, from the other character’s point of view. Then, throw in some added content that concludes with a memory-erasing spell – of just the new content. Be sure to include something that fully changes your perspective of BOTH characters since the event that occurs never would have happened with the characters as they have been written, yet make sure it serves no purpose and does nothing to move the plot forward. It’s just there for decoration. Have a strong-willed character who has lived for centuries, and needs nothing, run to the main character, a young 23 year old valley girl – for HELP. Because he needs a lot of help, and she can give it, right? Give a split personality to another character, that again, was invented in Book 7, and simply make the character the exact opposite of who they were before. Make sure to make her extremely annoying. Nails-on-the-chalkboard annoying. Shift point of view from one character to another for the entire book. Make sure this doesn’t actually serve any purpose. Just use it because other authors do it. Why not, right? In fact, be sure to give a few chapters to some minor characters who are not relevant to the story. Plot? Who cares about plot? Don’t worry about details being congruent. For instance, when a character is invisible (again, it doesn’t matter that this type of magic has never happened in the previous books, just go with it), and the character makes a point to tell you that anything she touches or holds is invisible, you don’t need to keep this line of fantasy going. No one is paying attention anymore. So it’s totally okay to have her stand on a scale, and have the scale disappear, yet in the next sentence, read a book. The book doesn’t become invisible because details do not matter, right? Right. Oh, and be sure to end on your classic cliffhanger, but, to fully make sure your fans never read the next book – use a minor character for nail-bitting-thrilling ending – one we care absolutely nothing about. Karen Marie Moning, you should be ashamed of yourself.